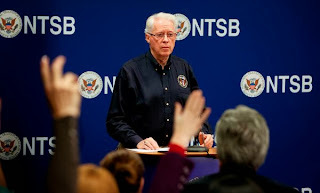 Normally, this site focuses on airline related safety and security events, but the NTSB investigation into the 1 December 2013 fatal derailment of a commuter train in New York is an exception because some of the recent developments in the investigation are quite relevant to how the NTSB would investigate future airline accidents. The NTSB is best known for its investigations of airline accidents, but it also investigates accidents involving other modes of transportation, including rail accidents. NTSB Board Member Earl Weener, who is a former Boeing executive, is heading the investigation of the fatal 1 December 2013 crash of a Metro-North commuter train in New York, and part of that process includes involving relevant parties that provide technical expertise in support of the NTSB's investigation. During the early part of the investigation, the NTSB serves as the primary conduit of information to the media and the public on the progress of the investigation, and sticks primarily to factual information about the accident. Determination of probable causes, and the role of organizations and individuals in the accident typically happens much later in the investigation. One of the parties invited to participate in this investigation was the Association of Commuter Rail Employees (ACRE), which represents Metro-North several categories of Metro-North employees. However, the NTSB abruptly removed ACRE from the investigation onm3 December 2013 after a representative of the union gave a series of briefings to the media where that representative discussed and interpreted information related to the ongoing investigation. This is a very rare move for the NTSB, and one that underscores the importance that the NTSB places in adhering to its investigation process. If this had been an airliner accident investigation, the NTSB would have likely taken the same action. While news media organizations and other groups not directly involved in the investigation are free to speculate about the causes of an accident, parties that are part of the NTSB investigation don't have that option. There are many reasons for this, and perhaps the most obvious one is that publicly speculating about the causes of an accident is inappropriate before all of the relevant factual information about the accident has been analyzed. Below is Earl Weener's NTSB briefing from 3 December 2013. The SOAR Fear of Flying program has a special extended Cyber Monday offer for you. From now until Friday December 6, 2013, save $100 on the most popular packages SOAR offers.You can save $100 from the normal $480 prices for the SOAR Program Package or the $595 Guaranteed SOAR Package. Please visit the SOAR special offer page for more information. There are many reasons for this, and perhaps the most obvious one is that publicly speculating about the causes of an accident is inappropriate before all of the relevant factual. This is true, and sometimes it's easy to speculate, but facts dictate true result.